At the heart of the Global City is a towering display of Philtown's development prowess, the 43-storey One McKinley Place. an unquestionable pride at the heart of Fort Bonifacio, this first venture of Philtown into high-rise luxury condominiums is an undoubted success made even more by interior designer, the celebrated Anton Mendoza. On the beautiful lobby that boasts of magnificence and grandeur, Mendoza explains, "The design concept is based on having double height to show the space in luxury. Glass is used to bring the outdoors in ....its very precise and straight to the point." Earth-tone sofa sets and elegant art work provide a perfect mix against the glass panels which undoubted provide depth and sophistication to the structure. 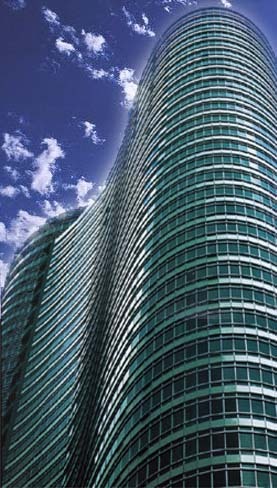 The texture is well provided by the uneven cylindrical angles which create the chic finish to the stylish building. CLICK HERE FOR USEFUL TIPS ON BUYING A CONDO PROPERTY!!! Disclaimer: The information found herein are subject to change without prior notice. Interested parties are requested to verify all information relating to the property prior to purchase. CONDO-PHILIPPINES .COM is not authorized to collect any forms of payments to clients & buyers please make all payments payable to the developer with corresponding OFFICIAL RECEIPTS follows. 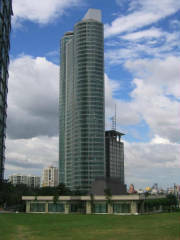 One Central Makati, Philippines.The newest and most luxurious residential condominium project with unmatched central location.